Prosecutors in Saudi Arabia have begun investigating 57 young men who were arrested on Thursday for flirting with girls at shopping centres in Mecca. The men are accused of wearing indecent clothes, playing loud music and dancing in order to attract the attention of girls, the Saudi Gazette reported. They were arrested following a request of the Commission for the Promotion of Virtue and Prevention of Vice. 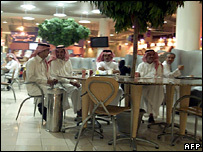 The mutaween enforce Saudi Arabia's conservative brand of Islam, Wahhabism. Earlier in the month, the authorities enforced a ban on the sale of red roses and other symbols used in many countries to mark Valentine's Day. The ban is partly because of the connection with a "pagan Christian holiday", and also because the festival itself is seen as encouraging relations between the sexes outside marriage, punishable by law in the kingdom. The Prosecution and Investigation Commission said it had received reports of such "bad" behaviour by 57 young men at a number of shopping centres in the holy city of Mecca, the Saudi Gazette said. The guardians of some of the men defended their actions, however, saying they would regularly get together at the weekend to have fun without ever violating laws governing the segregation of the sexes, it added. Whatever happened to Saudi reform?